We all know that Android phones also have separate and reserved RAM memory as like other computers have. This memory is used by system and apps to perform their work. In simple words, this is the place where system and all other third-party apps save their cached data and do all what they are made to do. If you have little bit knowledge about how Android system works, you might know it very well that RAM is directly related to your device's performance and speed. The more RAM space will be, the more fast and smooth your phone will work. It's very important to check and monitor RAM memory usage in your Android time to time. You might have hundreds of apps installed in your phone. Did you know which app is eating the most RAM memory and slowing down your phone's performance. Here in this tutorial, I will guide you how to find out this. How applications use RAM memory? As already mentioned, apps use RAM memory to save their temporary files (such as images, text or thumbnails) and perform all their functions. Each app needs its own room to operate and that's why they are assigned separate space in RAM memory. As soon as the operation is completed, app will automatically leave the memory and delete all its cached data. While on the other hand, some applications use RAM space and save their cached data in it, but never delete them after use. RAM is never emptied completely. Every time, some apps (or their services) are running in background even when you're not using them. For example, when your phone is locked or its screen is black, you'll still receive Facebook push notifications. This was possible only because of Facebook services running in background. 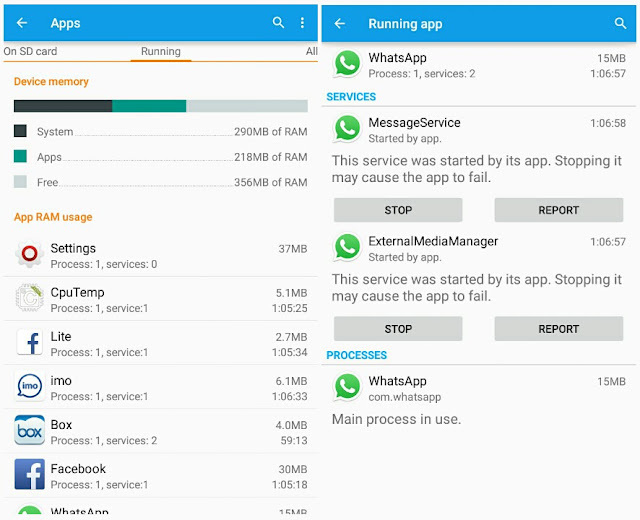 These are some of the common reasons why Android phone run out of low RAM space. Due to which, it may start hanging, crash apps automatically and slow down the phone's speed. The only way to solve this issue is to free up some RAM memory, which we will discuss later in this tutorial. If you think that we are going to use a third-party tool, than you're absolutely wrong. 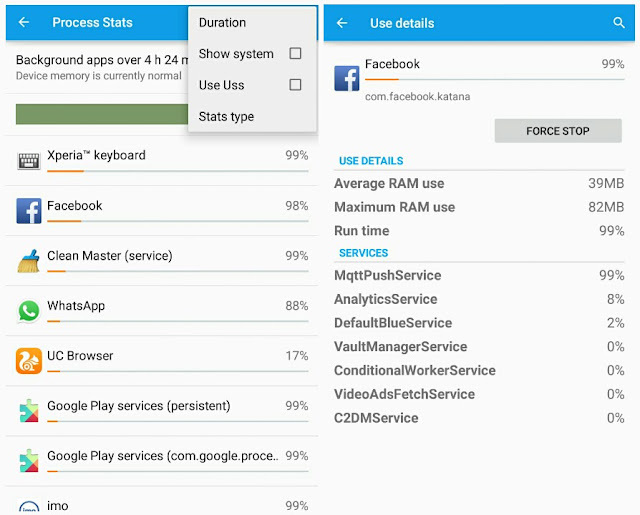 Android has an in-built tools which keep record of all your RAM usage details automatically. Basically, there are two methods and both are explained below. First of all, go to "Settings" and click "Apps" option. Now scroll left to the "Running" tab. Here you'll find all your RAM memory usage details. If you're using Android 5.0 and later versions, you'll find three things under "Device Memory" section, which are system, apps and free. The total RAM size will be the sum of all these things. Note that, they may fluctuate and change every second. This depends on your system and apps usage. New things are added and deleted from memory every time. If the system and apps usage will decrease, it will automatically increase the free space so as to keep the total size same and constant everywhere. From the same window, you can check and monitor individual app RAM usage manually. Next to the each app, you'll find number of process and services running in background for that particular app. To find out which process and services are running, tap the app name. You can also force stop them from running in background. At this point, you just have to filter out all those apps which are using maximum RAM memory. Facebook, Instagram, Flipkart, Snapchat and especially games, news and other social apps are the main culprit. Apart from using unnecessary RAM memory, they also eat battery life and slow down phone's performance. It's better to uninstall them. 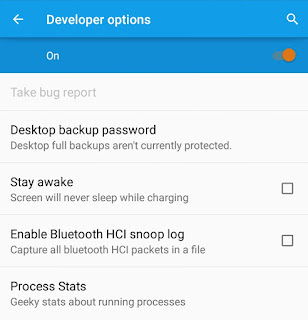 Android has hidden secret settings named as "Developer options", which are intended for development use only. People who make Android apps can use them to test their app performance and for debugging process. One the most popular and useful feature of developer options is "Process Stats". First of all, go to "Settings". Now scroll down and click "About phone". Here you'll find "Build number" option. Simply click it more than 7 times as fast as you can. After this, a dialog box will appear showing "You're now a developer!" message. Now go back to the settings window and click this newly added "Developer options". To turn it on, simply switch on the button at the top-right corner of the screen. Finally click "Process Stats" option. Here you'll find a geeky stats about running processes over a particular time period. To find out more information about the app, tap its name. Under use details section, you'll find maximum and minimum RAM use and total run time. Again, if any app is using unnecessary RAM memory, you can force stop it any time. You can also change the stat type and duration time period. To do this, go back to the process stats window and click the menu button (three dots at the top-right corner of the screen). Now click "Stat type" and change it to foreground or cached. In the same way, you can easily change duration time. If you want to add system usage details, tick mark "Show system" option. Now come to the conclusion part. So what to do with the apps with high RAM memory usage? The short and simple answer is to uninstall them. Of course, you can also force stop apps from running in background but you've no solid reason for this action. As soon as you'll stop them, some apps may start their services again after some time. Now think it in this way. Instead of using Facebook, Twitter and other social apps, you can use them directly access their website from UC browser to reduce your RAM memory usage. Moreover, UC is fast and use less Internet data. Same thing can also be applied on news apps as well. If your Android phone is running out of low RAM memory, here are few things which you can do to free up some space. Delete cached data: The first thing you've to do is to clear all system and apps cached data. To do this, go to "Settings > Storage" and click on "Cached data" option followed by OK button. Make sure to uninstall or force stop all useless applications. 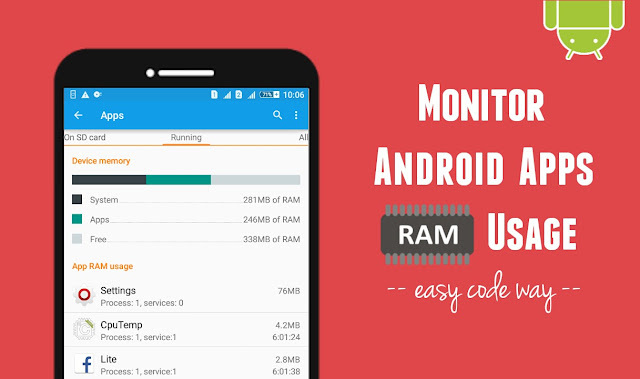 This is how you can monitor RAM memory usage in your Android phone without using any third-party tool. Now I just hope that you've complete knowledge about this topic. If you've some burning questions in your mind, don't forgot to drop them in the comments. Stay tuned for more interesting tutorials. Did I had missed something?